This graphic shows the process for creating complex frameworks from nanoparticles and DNA. Nanoparticles (yellow balls) coated with short single-stranded DNA (blue squiggly lines) are mixed with various polyhedral DNA frames (from top to bottom: cube, octahedron, elongated square bipyramid, prism and triangular bipyramid). The frames' vertices are encoded with complementary DNA strands for nanoparticle binding. When the corresponding frames and particles mix, they form a framework. Image: Brookhaven National Laboratory. A cube, an octahedron and a prism are among the polyhedral structures, or frames, made of DNA that scientists at the US Department of Energy's (DOE) Brookhaven National Laboratory have designed to connect nanoparticles into a variety of precisely structured three-dimensional (3D) lattices. The scientists have also developed a method to integrate nanoparticles and DNA frames into interconnecting modules, expanding the diversity of possible structures. These achievements, described in papers in Nature Materials and Nature Chemistry, could lead to the rational design of nanomaterials with enhanced or combined optical, electric and magnetic properties. Gang's team has previously exploited DNA's complementary base pairing – the highly specific binding of chemical bases known by the letters A, T, G and C that make up the rungs of the DNA double-helix ‘ladder’ – to bring particles together in a precise way. Particles coated with single strands of DNA with a defined sequence of bases link to particles coated with strands with a complementary sequence (A binds with T and G binds with C) while repelling particles coated with non-complementary strands. "In our approach, we use DNA frames to promote the directional interactions between nanoparticles such that the particles connect into specific configurations that achieve the desired 3D arrays," said Ye Tian, lead author of the Nature Materials paper and a member of Gang's research team. "The geometry of each particle-linking frame is directly related to the lattice type, though the exact nature of this relationship is still being explored." So far, the team has designed five polyhedral frame shapes – a cube, an octahedron, an elongated square bipyramid, a prism and a triangular bipyramid – but a variety of other shapes could be created. "The idea is to construct different 3D structures (buildings) from the same nanoparticle (brick)," explained Gang. "Usually, the particles need to be modified to produce the desired structures. Our approach significantly reduces the structure's dependence on the nature of the particle, which can be gold, silver, iron, or any other inorganic material." To design the frames, the team used DNA origami, a self-assembly technique in which short synthetic strands of DNA (staple strands) are mixed with a longer single strand of biologically-derived DNA (scaffold strand). When the scientists heat and cool this mixture, the staple strands selectively bind with or ‘staple’ the scaffold strand, causing the scaffold strand to repeatedly fold over onto itself. Computer software helps them determine the specific sequence required to ensure the DNA folds into desired shapes. The folding of the single-stranded DNA scaffold exposes anchoring points that contain free ‘sticky’ ends – unpaired strings of DNA bases – where nanoparticles coated with complementary single-strand tethers can attach. These sticky ends can be positioned anywhere on the DNA frame, but Gang's team chose the corners so that multiple frames could be connected. For each frame shape, the number of DNA strands linking a frame corner to an individual nanoparticle is equivalent to the number of edges converging at that corner. The cube and prism frames have three strands at each corner, for example. By producing these corner tethers with varying numbers of bases, the scientists can tune the flexibility and length of the particle-frame linkages. The interparticle distances are determined by the lengths of the frame edges, which are tens of nanometers long in the frames designed to date, but the scientists say it should be possible to tailor the frames to achieve any desired dimensions. The scientists verified the frame structures and nanoparticle arrangements through cryo-electron microscopy (a type of microscopy conducted at very low temperatures) at the CFN and Brookhaven's Biology Department, and through x-ray scattering at the National Synchrotron Light Source II (NSLS-II), a DOE Office of Science User Facility at Brookhaven. In the Nature Chemistry paper, Gang's team described how they used a similar DNA-based approach to create programmable two-dimensional (2D) square-like DNA frames around single nanoparticles. DNA strands inside the frames provide coupling to complementary DNA on the nanoparticles, essentially holding the particle inside the frame. Each exterior side of the frame can be individually encoded with different DNA sequences. These outer DNA strands guide frame-frame recognition and connection. Gang likens these DNA-framed nanoparticle modules to Lego bricks. "Each module can hold a different kind of nanoparticle and interlock to other modules in different but specific ways, fully determined by the complementary pairing of the DNA bases on the sides of the frame," he said. Mixing different types of modules together can yield a variety of structures, similar to the constructs that can be generated from different Lego bricks. By creating a library of the modules, the scientists hope to be able to assemble structures on demand. The selectivity of the connections allows different types and sizes of nanoparticles to be combined into single structures. The geometry of the connections, or how the particles are oriented in space, is very important for designing structures with desired functions. For example, optically-active nanoparticles can be arranged in a particular geometry to rotate, filter, absorb and emit light – capabilities that are relevant for applications such as display screens and solar panels. By using different modules from their ‘library’, Gang's team has so far demonstrated the self-assembly of one-dimensional linear arrays, ‘zigzag’ chains, square-shaped and cross-shaped clusters, and 2D square lattices. The scientists have even generated a simplistic nanoscale model of Leonardo da Vinci's Vitruvian Man. 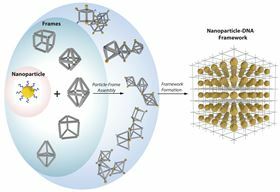 "We wanted to demonstrate that complex nanoparticle architectures can be self-assembled using our approach," said Gang. Again, the scientists used sophisticated imaging techniques – electron and atomic force microscopy at the CFN and x-ray scattering at NSLS-II – to verify that their structures were consistent with the prescribed designs and to study the assembly process in detail.